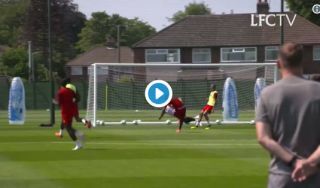 Liverpool goalkeeper Danny Ward pulled off a superb save in training today as reports emerge that he could convince Jurgen Klopp against dipping into the transfer market for a new signing in that position. The Daily Mirror claims the Reds are not looking likely to bring in a new ”keeper despite links with Roma shot-stopper Alisson. Loris Karius and Simon Mignolet took it in turns as no.1 for LFC last season, but neither impressed and a new addition between the sticks looked a highly logical move ahead of next season. Ward could now get the chance to be first choice in goal for Liverpool as the Mirror report that he’s impressed Klopp.